Hurry! There are just two days left to cast your #TDBringItBack vote! We’re bringing back fifteen classic designs from Tatty Devine history as a limited edition collection and we need your help to decide the all important 15th piece. We’ve narrowed it down to five of Rosie, Harriet and Team Tatty’s favourite pieces, but it’s up to you to choose which one you think should come back over on Facebook. Join Team Tatty as we delve in the back stories, discover the design inspirations and state the case for each piece up for the vote. Can you believe your eyes? Today, we're taking a closer look at the 3D Glasses Necklace! This Perspex take on a classic pop culture icon first appeared in our Spring Summer 2008 collection, Movie Mayhem. Kelly Osbourne even modelled a limited edition customised version for the charity Trekstock! 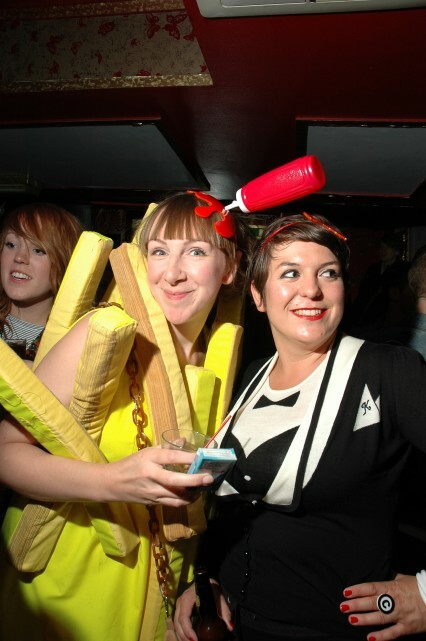 Rosie says, "We hosted a big party at Madame JoJo's in Soho to launch the collection during London Fashion Week. It was so much fun! We had popcorn girls handing out treats, amazing bands, a Tatty Devine raffle and a screen test photo booth where our guests tried on all the new jewellery! It's interesting to see lots of films coming out in 3D at the moment. It just wasn't normal back when we designed the 3D Glasses Necklace. It was so lovely to take a throwaway object and turn it into jewellery that's treasured forever. 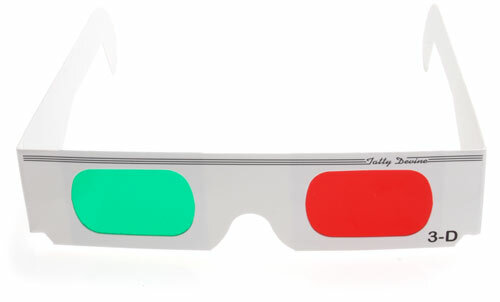 We even made special Tatty Devine sellotape with the 3D glasses design and classic paper versions for our party, too!" Harriet agrees, "3D glasses are just eternally cool. I'm so sad they don't look like this anymore! I go to the cinema and get handed a pair of plastic Ray Ban-type glasses and it's not the same! I want classic white cardboard with red and green lenses! It's part of my obsession with Americana and films where teenagers drive around town all night and go to the diner until the sun rises. 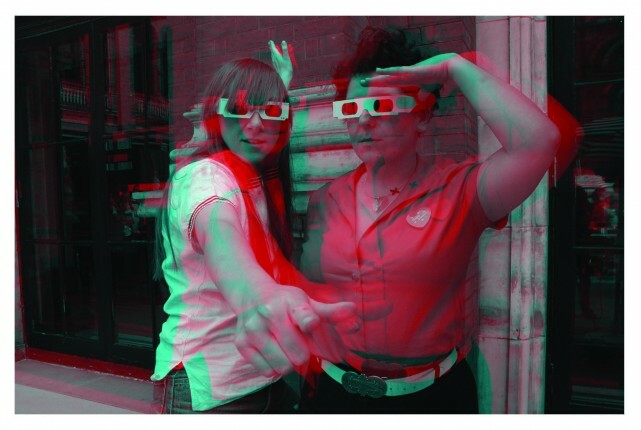 We even had our photo taken in 3D at the V&A Village Fete that year!" Team Tatty says: Laser cutting star Lusea, "Vote for the 3D Glasses Necklace! I think it's really cool, retro and fandabbidosy! Imagine how cool it would be to see everything in 3D. Watch out Google Glass, here comes Tatty Devine!" Kent studio star Megan: "I'm voting for the 3D Glasses Necklace as it brings back happy memories of being on my work placement at Tatty Devine and takes me back to being in my 3rd year at uni!" Calling all movie buffs! 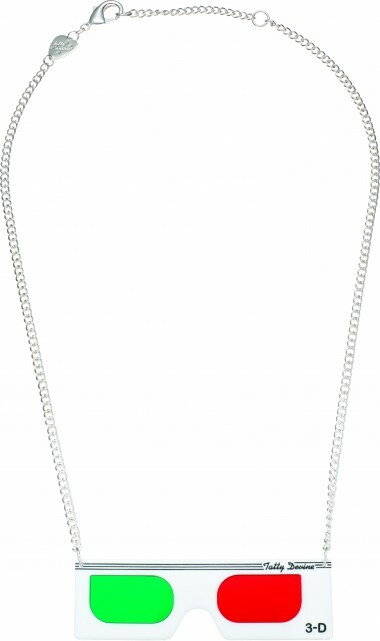 Want to add the 3D Glasses Necklace to your collection? Simply head over to our Facebook album and cast your vote by liking its photo. The most popular piece will launch in store and online as part of our 15th birthday collection, and one lucky voter will win the chosen piece for their collection. Yes, really! Hurry, you only have until midnight on Sunday 13th July to have your say. Show your love for the 3D Glasses Necklace on Twitter and Instagram with the hashtag #TDBringItBack now!